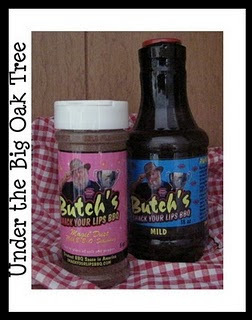 Under the Big Oak Tree: Giveaway: Butch's Smack Your Lips BBQ ~ Let's Get Grilling! 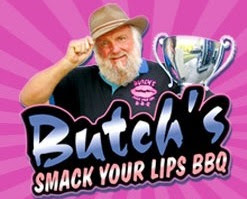 Giveaway: Butch's Smack Your Lips BBQ ~ Let's Get Grilling! I don't know about you, but I sure am looking forward to Memorial Day Weekend! For me, the holiday weekend always means the start of summer. Especially, when I was a kid. After the holiday weekend, the last few weeks of school were always fun-filled and full of excitement as we looked forward to summer vacation! Now, as an adult, I look forward to Memorial Day because it's the weekend that all of the family cook-outs start and run every weekend throughout the summer! Sure, we grill all year long but not the big, family-filled barbecues like during the summer! I'm really looking forward to filling my freezer with burgers, hotdogs, chicken and steaks! I also need to place an order with Butch's Smack Your Lips BBQ and restock my pantry in order for it to be ready for the grilling season! If you're a regular here, you probably remember me telling you about my family's favorite barbecue sauces and dry rubs! Well, in honor of Memorial Day and the start of grilling season, the kind people at Butch's Smack Your Lips BBQ are allowing me to share their great products with one lucky winner! This entry is mandatory. After completing this entry, you may continue on to earn additional entries. Visit Butch's Smack Your Lips BBQ and tell me in a comment on this post which flavor barbecue sauce and dry rub you would like to win. After completing the mandatory entry above, you can then earn additional entries. Be sure to leave a comment for each completed task below, as your comment is your entry. Also, don't forget to include your email address so I can contact you if you win! Like Butch's Smack Your Lips BBQ on Facebook. Like Under the Big Oak Tree on Facebook. Enter the V8 V-Fusion Sparkling Giveaway currently running on this blog. This giveaway ends Tuesday, May 22, 2012 at 10:00 pm EST. Mandatory Entry must be completed first before earning additional entries. Winner will be chosen via random.org and will be contacted by email. Winner will then have 48 hours to provide contact information or another winner will be selected. Don't forget to leave a seperate comment for each entry, since each (qualifiying) comment counts as a seperate entry. Don't forget to provide your email address in order for us to contact you if you win! I was not financially compensated for providing this giveaway. The sponsor was kind enough to provide the products that are the prize for this giveaway. Any opinions or thoughts mentioned in this post are honest and my own. I would love to try this all my family loves BBQ. I would like to try Butch's Super Pyro Fragilistic Habanero Wing Sauce and Cajun Magic Dust Dry Rub. i entered the v8 giveaway. i like Butch's Smack Your Lips BBQ on FB. i like Under the Big Oak Tree on FB. I would like Mild BBQ Sauce and Magic Dust Rub Mild. I entered V8 V-Fusion Sparkling Giveaway.